Devoted maid Mary Ballard’s world is built on secrets, and it’s about to be ripped apart at the seams, in this lush and evocative debut set in 19th century New York, perfect for fans of Sarah Waters’s Fingersmith and Emma Donoghue’s Slammerkin.By day, Mary Ballard is lady’s maid to Charlotte Walden, wealthy and accomplished belle of New York City high society. Mary loves Charlotte with an obsessive passion that goes beyond a servant’s devotion, but Charlotte would never trust Mary again if she knew the truth about her devoted servant’s past. Because Mary’s fate is linked to that of her mistress, one of the most sought-after debutantes in New York, Mary’s future seems secure—if she can keep her own secrets… But on her nights off, Mary sheds her persona as prim and proper lady’s maid to reveal her true self—Irish exile Maire O’Farren—and finds release from her frustration in New York’s gritty underworld—in the arms of a prostitute and as drinking companion to a decidedly motley crew consisting of a barkeeper and members of a dangerous secret society. Meanwhile, Charlotte has a secret of her own—she’s having an affair with a stable groom, unaware that her lover is actually Mary’s own brother. When the truth of both women’s double lives begins to unravel, Mary is left to face the consequences. Forced to choose between loyalty to her brother and loyalty to Charlotte, between society’s respect and true freedom, Mary finally learns that her fate lies in her hands alone. 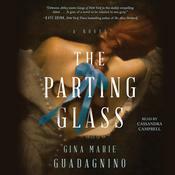 A captivating historical fiction of 19th century upstairs/downstairs New York City, The Parting Glass examines sexuality, race, and social class in ways that feel startlingly familiar and timely. A perfectly paced, romantically charged story of overlapping love triangles that builds to a white-knuckle climax, this is an irresistible debut that’s impossible to put down.